The sun is out in Essex and you’re thinking that you’d love to be on the beach. But oh wait, you’ve heard that you can hire beach huts, so google becomes your friend as you embark on the hunt for that perfect beach hut hire. You will quickly find yourself swamped with writing some notes, reading reviews and trying to sift through the various websites. The thing is, you know and I know, and even The Little Beach Hut Company knows that two names will crop up time and time again. I can see you right now with our two websites open trying to make decisions based on availability, locations, price and even beach hut names. You may even create a little list of pros and cons comparing The Little Beach Company vs Millie’s Beach Huts. Wouldn’t it be so much easier if someone put all the facts on each beach hut hire company in one place? Well, I like a challenge and as you’ve asked, let’s try to help you work out which is best for you. Where can I find a Beach Hut for Hire? If you are just setting out on your journey to find a Beach Hut for Hire, do be quick to secure summer dates with popular beach huts and dates selling out 12 months in advance. As you’ll find out below, these particular beach huts are in demand. The Little Beach Hut Company vs Millie’s Beach Huts: Which is Best? Location: All beach huts are based on Mersea Island, Essex. Price: A really easy to understand pricing structure with one rate all year round. The price for each days beach hut hire ranges from £55 (Bertie) to £70 (Kitty). Discounts are available for up to 7 days beach hut hire. The number of Beach Huts for Hire: The Little Beach Hut Company have five beach huts in total. All bar one beach hut for hire are front row beach huts. Note that all front row beach huts are directly on the sand on the beach. Availability: as of 9th April, all summer August dates are fully sold out and you can book up to 31st December 2017. If you wish to secure a special date or summer holidays, you must book several months ahead and/or when they open up each year’s bookings. Ease of Booking: Payment in full at time of booking. You can now book all beach huts online and check availability too. Group Numbers Allowed: As with all professional beach hut hires, you must adhere to terms and conditions limiting numbers to either 6 or 8 per beach hut. As such, there is a maximum of 8 guests at Betty, Percy, & Winnie (including children & babies) and 6 at Bertie & Kitty (including children & babies). Note that no two beach huts are side by side and no more than one beach hut booking per day. Transport and Parking: Mersea Island can be found to the south-east of Colchester. The nearest train station is Colchester which is approx 20 mins by taxi or you can take a bus. If you are driving you’ll find a large car park situated near the beach, however, you must remember to check the tide times which can affect your journey. At high tide, the main access to Mersea can be cut off, usually twice a day for only one week during the month. Once the tide covers the Strood, the island really does once again become an island for about an hour and a half, so do plan your arrival and departure times. 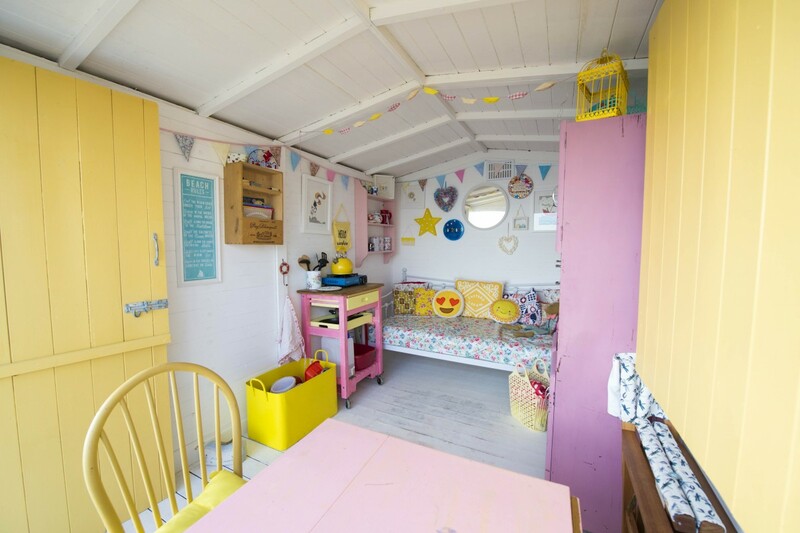 Decor/Style: With a 2015 Beach Hut of the Year winner (Betty), you won’t be surprised that it’s clear that a lot of love and attention has gone into each beach huts decor. Jane previously ran an online shabby chic accessories business and you can see how her interior design skills shine through in each hut. Think vintage but with colour and nods to the traditional beach hut but with colour that just makes you smile! You’ll spot bed throws, kettle and all the essential items you’ll need to make your day comfortable as well as feeling luxurious. Nearby facilities: Each beach hut is spread across the length of the beach with varying distances to toilets and nearby facilities. The Two Sisters Cafe is never too far away from each beach hut too. Water taps are available during the summer season. The Beach: Mersea Island’s sunny South facing beach overlooks the Blackwater Estuary. It’s a mix of sand & shingle and the shallow, tidal water is safe enough for a swim for confident swimmers. Certain areas of the beach welcome jet skiers and motorboat enthusiasts with the permission of the slipway owners with others designated to swimmers only for the safety of all users. Responsible dog walkers are welcome on Mersea beach all year round as are horse riders keeping below the tide line, however, dogs should be kept on a lead on the beach during the busy summer season. The one downside to the beach is that I feel it can be a little ‘muddy’ to get out to the water when the tide is out, so do plan your swims around this. Children’s Entertainment: While there is no Pier or local amusements, a day at a beach hut can be easily spent building sandcastles, flying kites and even crabbing. The causeway at West Mersea hard is the ideal place to crab and there are specific areas marked to do so too! Location: At the time of writing, Millie’s Beach Huts offers beach huts for hire in Walton-on-the-Naze in Essex (both Eastcliff and Southcliff sites). They are soon to launch beach huts in Felixstowe and Southwold. Price: Two rates currently apply for beach hut hires. Off Peak (£35) and Peak Season (£50). Peak season runs from May to end of September. No discounts are available for block bookings however the Millie’s Beach Hut Club subscription does provide a discount for those booking more three or more date and offers monthly or annual payments. The number of Beach Huts for Hire: 7 beach huts are currently available for hire with a further three beach huts being launched. There is a range of front row and second-row beach huts and you will find beach huts that are side by side for hire (Skye and Millie and Minnie and Mickey). Note front row beach huts are not directly on the beach at Walton-on-the-Naze with a seawall and promenade separating them from the beach. Availability: as of 9th April, with new beach huts launched, you can still book weekend and summer holiday dates in 2017. You can always book up to one year in advance (rolling 12 month booking calender). Ease of Booking: Payment is required in full at time of booking. You can book all beach huts online and check availability too. Group Numbers Allowed: As with The Little Beach Hut company above, as a professional beach hut hire, you must adhere to terms and conditions limiting numbers to either 6 or 8 per beach hut. As such, there is a maximum of 8 guests at Isla, Harley and Sunnysands (including children & babies) and 6 at Skye, Millie, Minnie and Mickey (including children & babies). You can hire Skye and Millie together or Minnie and Mickey for up to 12 guests as they are side by side. Transport and Parking: For beach huts located at Walton-on-the-Naze, you can reach the town by rail directly from London (circa 1hr 15mins). The train station is just a few minutes walk from the beach huts located in Southcliff. If you are driving there are residential streets and public car parks nearby though as with all seaside resorts these can be very busy during the summer season and weekends. Decor/Style: A Millie’s Beach Hut has been shortlisted twice for Beach Hut of the Year, making the top 10 in both 2015 and 2016. Bright, fun, practical and cosy! With a mix of Cath Kidston or Cornishware crockery and Emma Bridgewater melamine, you can also find ‘happy wall’s filled with small business decor. Each hut it’s has it’s own style or theme but a standards list of contents to ensure that you can always expect the same standards in each beach hut. Nearby facilities: Each beach hut is spread across the promenade with varying distances to toilets and nearby facilities. Water taps are available during the summer season and year round toilets available opposite the Pier. The Beach: An award winning fine sandy beach which stretches from the Naze through to Frinton-on-Sea. Lifeguards do operate throughout the peak season and you’ll spot visitors paddling or having a little swim too! The part of the beach directly in front of Southcliff beach huts are dog-friendly year round, though small stretches do have restrictions in place within the Eastcliff development from May to September. This will also apply to the new Southwold beach hut. The obvious downside is when the tide is in, there are limited stretches of the beach that say uncovered and worth planning your day around this. Children’s Entertainment: Walton-on-the-Naze beach huts are never too far from the second longest Pier in the UK. Expect the normal amusements, rides and even a bowling alley. There is a number of small cafe’s open throughout the main season and you’ll find a great fish and chip shop around a 10-minute walk near to the town centre. You could, however, bunker down with your picnic and just spend the day on the beach building sandcastles and flying kites. Keep an eye out for shark teeth if using the Eastcliff beach huts. This is a well-known area for finding those and though it can be unpredictable some of the largest teeth have been found in the area. So having written the above, I can understand your dilemma. Mille’s Beach Huts are cheaper to hire but with similar standards of decor. However, The Little Beach Hut Company beach huts are predominantly on the beach. 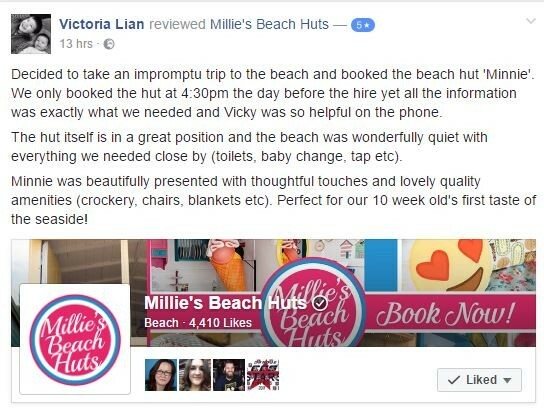 Millie’s Beach Huts have the option of the Pier to keep the kids entertained and will be based in more than one location, while The Little Beach Hut Company forces the family to have some down time on the beach without distractions. The reality is, the choice does depend on you. It depends on your budget, how far ahead you are willing to book, where you live and in some cases, it will depend on whether one of us has a beach hut that has the same name as a family member! 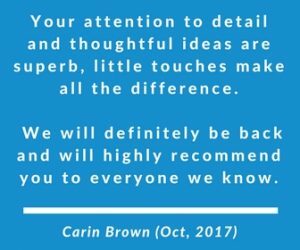 However, it’s not just us as businesses that make your day special. It’s you. It’s you and how you spend your day. It’s the people you are with and the things you do that create those memories. Whether you are reading a book, making sandcastles or just watching the world go by. I know that every hut owned by us both has a huge amount of love and care put into them and you will have an awesome day! I just know it. Be the first to be notified of beach hut news, free stuff, release dates and special offers. Whether you hire or own a beach hut - join me on a road trip to the beach. In the interest of balance it would be appropriate to acknowledge how much longer Jane and Jayne have been trading? Particularly as their business model and aesthetic has clearly been such an inspiration. And also to detail the delightful private catering options they offer visitors. For a truly fair review. Hey Emily – thanks for taking the time to read and comment on a rainy Saturday! Everyone is so different with their purchasing decisions that I think the list could have gone on and on and on). It’s fascinating how people choose between our own huts and I hadn’t thought about trading time playing a major factor in buying decision so thanks for flagging! Re business model – I think there are upwards of 250 beach huts to hire on the main websites and I’m thrilled more are choosing to hire out. It’s clear your a beach hut fan to know us both so well – don’t you find it so frustrating to see beach huts boarded up and unused and at the same time owners struggling with costs to maintain? Its one of the reasons we operate a different model to help owners too. Designs an interesting one isn’t it? All of our mood boards for each beach hut are publicly available on Pinterest so feel free to have a nosy around you can see where our inspiration has come from and all the amazing small businesses we’ve worked with to do so. Though I give conrad kudos for our ice-cream cone and our brand manager – she was def the inspiration behind our ‘Millie’ beach hut! So. How Was Your Holiday?